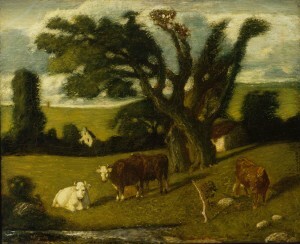 Ryder painted scenes of farm animals and rolling, bucolic landscapes throughout his career. A Pastoral Study is one of the latest of this genre of work, but one of his most subtle and ambitious. Long ignored by the public, Ryder was an important “discovery” of the Armory Show and was well represented by ten paintings. A Pastoral Study was lent by the collector John Gellatly, who also lent American Impressionist paintings by Theodore Robinson and John Henry Twachtman. Ryder’s work was hung in the historical survey of American art that the organizers conceived to demonstrate the roots of contemporary art. Dorinda Evans, “Albert Pinkham Ryder’s Use of Visual Sources,” Winterthur Portfolio 21 (Spring 1986), 24.